Being a veteran owned business, we here at KFE Brake Systems appreciates and supports America’s troops. For those who are willing to put their life on the line to protect our way of life. We want to give a big thanks to you. On February 28th, 2018, KFE Brake Systems have donated $300.00 to Rick Centanni Memorial Fund. Lance Corporal Rick Centanni is the only son of Santa Ana Police Department gang unit Sgt. Jon Centanni. In 2010, Lcpl Rick Centanni was deployed with 4th Light Armor Reconnaissance Battalion to Afghanistan in support of Operation Enduring Freedom. Lcpl Rick Centanni’s LAV were tragically hit by an IED on March 24th, 2010. Both Lcpl Rick Centanni and the battalion Sergeant Major, Sgt. Maj. Robert J. Cottle were KIA. This fund is setup to support scholarships for local student athletes, Sgt. 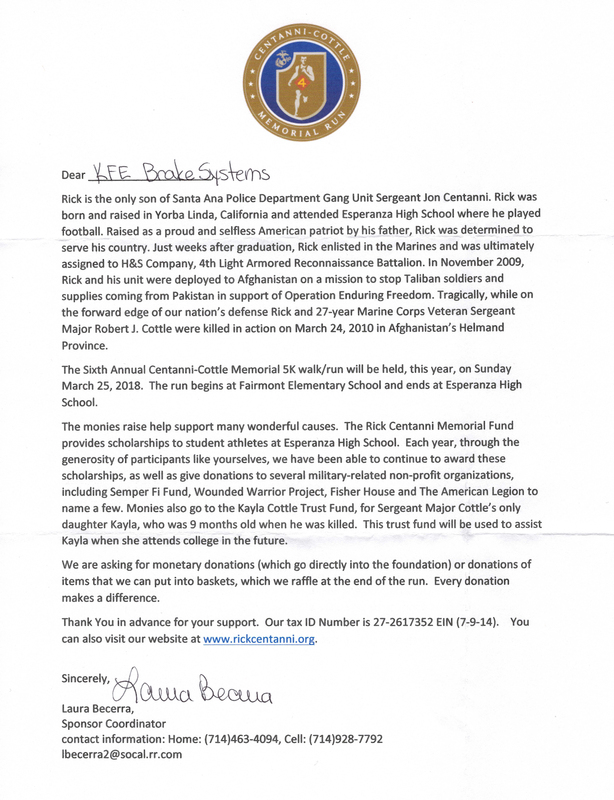 Maj. Cottle’s daughter, and other military related non-profits. Every year 4th LAR, local police and fire departments, veterans, and supporters comes together in support of the Rick Centanni Memorial Fund at the Centanni-Cottle Memorial 5K Walk/Run. This year, the 6th annual walk/run will be held on Sunday March 25nd, 2018. Please join us by supporting local heroes that sacrificed their lives for our safety and freedom. You may do so by registering for the Rick Centanni 5K.